Tree planters: Rep. Cinta Kaipat & family; Angelo Villagomez (BC, MINA & RC&amp;amp;D); Aya-san Matsumoto & Hideo-san Honda (Isa-CNMI); Friends of the Mariana Islands (FMI); Team Chura Talo; Juanita Fajardo; Little Miss Marianas 1st Runner Up Kassandra Tate Tudela Royal (not pictured but joined by Mom Bonnie & little sister Briana in making their 1st Beautify CNMI! 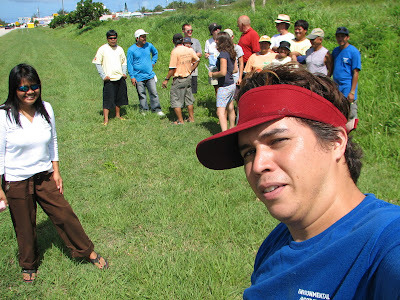 cleanup/planting); and Dr. Daniel Lamar (who also made his cleanup/planting debut with Beautify CNMI!). Welcome new volunteers/partners and thank you, salamat po, domo arigato, si yu'us ma'ase, and olomwaay to everyone!!! Today we planted our 100th Flame Tree of the 2007 rainy season! Considering that we only planted 22 Flame Trees last year, this is a very significant number. It took several groups and individuals collaborating to get these trees in the ground. We started way back in February. I asked Brad Doerr, a Mariana Island Nature Alliance member, to start growing Flame Trees for me. I told him that I didn't have money to pay him then, but by the time the trees were ready to plant, I would have figured something out. We came up with an Adopt-a-Flame Tree program. For $20, anyone in the world could have a Flame Tree planted in their name. We sold trees at the Flame Tree Arts Festival, the MINA Annual Meeting, and online. Over 100 trees were adopted. 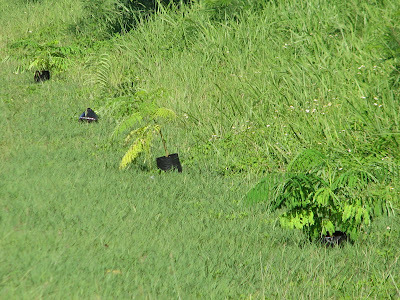 We started planting on June 19, the one year anniversary of Beautify CNMI's first tree planting. Then each weekend we would plant a few trees. We've had help from MINA, Marianas Resource Conservation & Development Council, Rep. Cinta Kaipat's Office & Family, Isa CNMI, Friends of the Mariana Islands, and a few dozen community volunteers. We're not finished, but a big thank you to everyone who has helped us reach this milestone! The first meeting of the CNMI Greenpower Alliance was held Sunday July 15 at 6 PM. There were 17 people present, with the group diversely composed of business people, consumers, students, and government representatives. The featured speaker was Alan Barak, Assistant Attorney General. In the past, Alan worked with Green Power Groups in the Eastern US and was instrumental in their success. Alan has been charged with writing the regulations for the implementation of Public Law 15-23, which allows for consumer-producers of alternative energy to generate and send up to 100 KW of energy back into the CUC grid and be compensated for it. Alan described the law briefly, and listened to feedback from the group on what they thought was important to be included in the regulations. You can review the law by going to our website at , where there are other links of interest as well. The website will soon feature a link to an online discussion group for members. Sunday morning Alan plans to post his initial draft of the regulations on the website. You can review it there in preparation for discussion and feedback to Alan at the next meeting. The next meeting will be held this Sunday, July 29 6 PM at Coffee Care. I suggest you arrive early as I anticipate there will be more present at this meeting and seating may be limited. The agenda will include a discussion of the initial draft of the regulations with opportunity to give feedback to Alan Barak. The second item will be a presentation on Wind Energy. There is a link to AWEA (American Wind EnergyAssociation) on our website. It has a broad ranging menu. I suggest going to the "Small Wind" menu tab and reviewing the selections on "Frequently Asked Questions" or "Advice From An Expert". There is also a link to equipment vendors. This will put you in good shape to gain the most from the presentation and discussion on wind energy at the meeting. After last meeting a small group stayed and and carried on informal discussions. Some ordered dinner as well. From my perspective, much useful information was shared during the aftermeeting discussion. favor of alternative, sustainable, renewable, environmentally friendly (Green) energy options in the CNMI. Your participation may also help these green energy solutions be cost effective and affordable. Energy and environmental concerns are at the forefront of people's minds wordwide. We are at a critical decision making time regarding the direction the CNMI will take in solving it's energy issues. History has shown that a small group of people can have a profound influence in determing the course of events, for better or for worse. There exists here and now an opportunity for you to be part of a group that helps shifts the direction of energy policy and outcomes in the CNMI in a positve direction towards green energy solutions. Visit the website, register, and encourage other like-minded individuals to do the same. 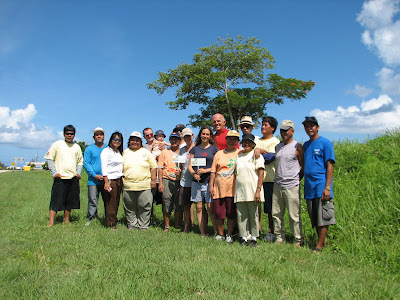 More than perhaps you realize, what we do here in the CNMI has global implications. We are in an excellent position to be a showcase for the world. Think globally, act locally. Hope to see you Sunday evening! The Zoning Office will present a workshop to educate the development community about the Saipan Zoning Law. The workshop will be held at the Multi-Purpose Center in Susupe from 8 am to noon on Thursday, August 2. Please contact the Zoning Office to reserve space at the workshop. Come out and support our partner PAWS! This Thursday, Club V is hosting an 80s party and $1.00 of the cover charge will be donated to PAWS. 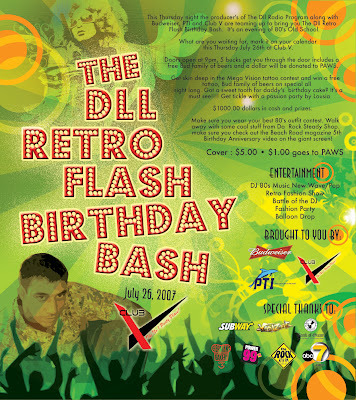 So, dig some 80s clothing out of your closet and head down to Club V! Today we planted 28 more Flame Trees and 10 Plumeria in and around the Koblerville Youth Center. These 38 trees are in addition to the 36 trees we planted last week. Wee also continued removing little, picking up trash thrown out of people's car windows. Seriously, can we stop throwing things out of the window as we drive? How hard would it to be to hold on to that beer can? The Flame Trees planted today are part of our Adopt-a-Flame Tree program. We finished planting in front of the Youth Center, then planted a row in front of Koblerville Elementary, and then planted a row along Monsignor Martinez where it intersects Koblerville Road. Cinta took a lot of pictures; look for her post! Mayor’s office has to spend $75,000 by Sept 30, we still have concerns that Tinian was able to build a shelter for $8000. Why is ours so expensive? A lot of us who volunteer for Beautify CNMI take for granted that the world understands what it is that we are. This video should help explain. Day 2 of the Marianas High School Painting Project. Maraming Salamat Po Friends of the Mariana Islands (FMI)! Back row: Rene & Robert. Front row: FMI President Tess Castillo, Mele, Precy, Rep. Cinta Kaipat & Radino. 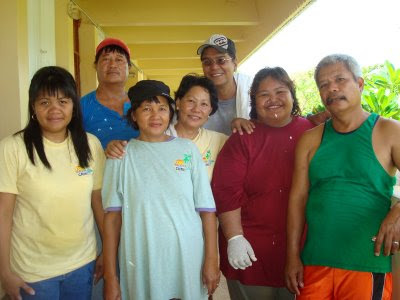 FMI has earned the title "Beautify CNMI's Supervolunteer Group" for their outstanding volunteer work in the CNMI. This Group epitomizes the Beautify CNMI! spirit of "volunteering from the heart." Beautify CNMI! is proud to partner with FMI. Mele wipes the sweat off her brows while Tess paints behind her. FMI President Tess Castillo making it look easy, though it wasn't. Dennis looks in on Rene. Rene sweated hard, but he did a great job! Precy carefully paints the wall. See? Even these guys are really trying their best to beautify the MHS! Si Yu'us Ma'ase Sablan Family Volunteers! 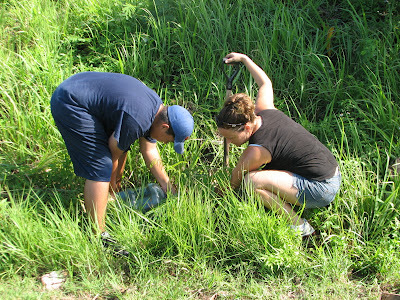 The Sablans -- Mike, Juanita, and Adam -- Beautify CNMI! 's Supervolunteer Family, joined Rep. Cinta Kaipat and other Beautify CNMI! coalition partners on Saturday, July 14, 2007, to help paint some classrooms at MHS. This was Day 2 of the painting project. A family that volunteers together, well . . . paints together! Mike miticulously trying to get the tough corners. 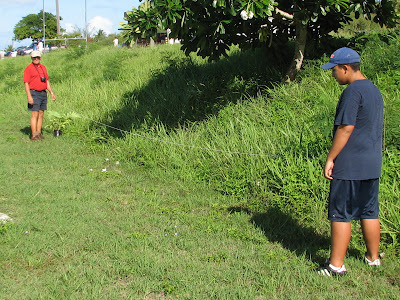 Young Enviornmental Warrior Adam Sablan showing why he is also a winner of the 2007 Beautify CNMI! Governor's Environmental Steward recipient. Adam's ever-present co-volunteer, Mom Juanita, with Rep. Cinta Kaipat in the background. Dennis Cabrera of Rep. Kaipat's Office prepares the paint. Adam looks on as Juanita and Rep. Cinta Kaipat discuss the best and fastest way to get the ceiling painted. Troops To Teachers' Eugene (in blue) looks on as Adam tries hard to reach the ceiling. Dennis pours more paint for Mike. Juanita and Adam take a drink and breather, while Mike, Gus Kaipat & Tony Benavente, President of MHS' PTA, work those muscles. Lei Kaipat looks on as Uncle Gus paints with his shades on to avoid dripping paint in his eyes. Meanwhile, Mike and Adam do their part, too. Mike, Tony, Adam, Juanita, and Gus busy ignoring the camera. Members of the fabulous Saturday crew: Beautify CNMI!, Office of Rep. Cinta Kaipat, Troops To Teachers, Adam Sablan and family, Kaipat family, and Beautify CNMI! 's Supervolunteer partners FMI (not pictured here). Thank You Troops To Teachers! The painting of the MHS classrooms is the second project that Troops To Teachers has undertaken with Beautify CNMI!, and I am sure it won't be the last. The Troops To Teachers Program is a unique program that Director Geri Willis started with four troops last year to give our returning servicemen and women an opportunity to earn a BA in Education and get paid a decent wage while studying and assisting in the classrooms The Pentagon is looking at our Program as a pilot program for the rest of the U.S. and elsewhere. Some intense concentration by Fred. Roman worked up quite a sweat. Gene worked with quiet strength. He can tie Adam for "quietest volunteer." Gene takes a much-need breather as Adam paints, Dennis pours, and Mike readies to re-load the paint. Fred showing he can get up high, too. Fred and Gene work quietly in the background. Roman Benavente, Jr. showing he's a chip off the ol' block. THANKS, TROOPS TO TEACHERS FOR A JOB WELL DONE! Dennis pours the paint for the team. Lei paints the ceiling with Tony Benavente. She paints the wall, too. Rep. Cinta coming in the give Juanita a spell. "Okay, Sister. Hand me that pole." Dennis peeks in on Rene. Gus (in yellow) doing his part. Lei looks on as Gus gets some upper-body exercise. Lei, in far corner, is joined by Roman Benavente, Jr. and Fred. Rep. Cinta Kaipat tries to reach those hard-to-get corners. . .
. . . and ends up getting some on her face! Olomwaay Gang for the SPLENDID JOB! Yes, I did say Salamat Po, FMI! A fellow blogger who dives regularly, recently recounted a story in which he helped two hermit crabs find new homes. Another fellow blogger/diver wasn't too happy with the first blogger/diver, and posted the previous blog post about not taking the shells of hermit crabs if a hermit crab was living in it. That really pissed off the first blogger/diver. I fish (not very well) and I eat fish. I eat crab and I've eaten hermit crabs off of the beach. Is it ethical for a SCUBA diver to take the shell from a live crab? Is taking a shell from a live crab similar to taking the horn from a Rhino (or Saipanda) or the fins from a shark? Or is it more like sheering the wool off of a sheep? Would it have been ethical to take the crabs if the diver had eaten the crabs? Since fishing with SCUBA is illegal, did the diver break the law? Is it ethical to use pictures from another site without permission? Is it enough to just link back to the original site? Do you have to get permission first? Did you know that White Spotted Crabs have a preference for Triton Trumpet conchs? These shells are a rare find, especially large ones. Some scientists believe that the large Tritons might be one of the only natural predators of Crown of Thorn Starfish, which are increasing in our waters. (TIME on-line) While a shell collector may see it as an amazing find, that crab species has to compete with the other large crabs in its habitat for another shell. Crabs locate shells by smelling the decay of dead mollusks. (Scully, 1986) The crab scavenges the shell and if no other crabs are around to compete for the shell, the crab will try it on for size and decide if it’s a good fit. Hermit crabs don’t just select any random shell. Imagine being a size 8 in shoes and forcing your foot into a 5. The size and shape of the crab also affects the types of shells they can inhabit. (Vance, 1972; Bulinski, 2007) White Spotted Crabs are highly selective and are generally found in the Triton’s Trumpets. (UH Manoa Bishops Museum) The availability of large shells is limited. Beautify CNMI has several long term goals. We want to promote Ecotourism in the CNMI (there is currently no Ecotourism here), we want to restore and promote many of our historical landmarks (i.e. the Japanese Jail and the Lighthouse) as tourist/historical sites, we want to reduce illegal dumping and littering, and we want to create an interconnected system of parks and trails. One of those parks is going to be located on top of the old airstrip in Koblerville, currently the site of the Koberville Youth Center and Substation. We started work on this project last year. We took an overgrown old abandoned airstrip littered with trash and grafitti and simply started cleaning. We mowed the grass. We got rid of the weeds. We painted over the grafitti. We've kept this up for almost a year. Last month, with the involvement of several government entities, we helped open up the Koblerville Youth Center. For almost a month now, we've participated in Family Fun Night, held at the Youth Center every Friday night for the residents of Koblerville. Little by little, we are getting people to use the park and we are continuously improving it. Yesterday morning we planted 36 Flame Trees along the street. They are small now, but in a year they will be over 10 feet tall. In three years they will be tall enough to provide shade. About six months ago I asked one of the Mariana Island Nature Alliance members, Brad Doerr, to start growing Flame Trees. I told him that I didn't have money to pay him then, but by the time they were tall enough to plant, I would. I came up with an Adopt-a-Flame tree program. For $20 via cash, check or paypal, anyone in the world could purchase a Flame Tree. I promised the adoptee a certificate and a picture of their tree posted on the Internet along with the GPS coordinates of their tree. I use the money to purchase the trees, soil, flagging tape, shovels, and whatever else we need to get the trees planted. Then I recruit volunteers to help me plant the trees and invite the people who adopted the trees to tag along. Yesterday I had help from Ken Kramer, his mom, his wife and two kids, Missy and Jim Highfill and their kid, Rep. Cinta Kaipat, Gus Kaipat and his 30-40 nephews, Marites Castillo and the Friends of the Mariana Islands, Captain Carl and his two shipmates, Neta and Flurina, Brad Doerr, and Laura Williams and her son Caleb. All it took for us to get these 36 trees planted were 26 tree planting volunteers (including myself), a little pre-planning on my part to ensure that we would have Flame Trees to plant during the rainy season (coordinating with Brad), and 36 generous donors to spend $20 to adopt a Flame Tree. In getting the trees adopted, we also had help from everyone who helped us man our booth at the Flame Tree Arts Festival back in April and MINA, which takes care of Beautify CNMI's finances. Basically what I'm trying to say is that planting these 36 trees was a community effort. Probably well over 100 people had a hand in coordinating the planting, from making sure that we had trees, shovels, soil, finances, water, snacks for volunteers, to getting people to adopt the trees, to actually planting the trees, and so on and so on. Thanks to every single one of you who helped out. These 36 trees are a significant contribution to the community of Koblerville. In 5 years, we'll all be able to say that we had a hand in providing shade, beauty, and cooler temperatures to the residents of Koblerville. We are planting Flame Trees in Koblerville today! If you want to help out, come to the Koblerville Youth Center TODAY at 9 AM. We'll be there until about noon. Thanks to all who volunteered to help paint 15 classrooms at Marianas High School. The painting project began on Wednesday, July 11, but we began a two-day painting project on Friday, the 13th. The Office of Cinta Kaipat and Friends of the Mariana Islands (FMI) donated paint brushes. Other Beautify CNMI coalition partners who provided the manpower included Gus Kaipat and the Kaipat Family Volunteers, and Team Chura Talo. Others who were there also included Beth Nepaial and Sam, who were joined by Patty Mendoza and other young volunteers. The MHS Class of '83 also painted two classrooms on this day. Thanks also to PTI for providing the paint rollers and pans and a big thank you goes to First Hawaii Bank for the donation of thousands of dollars to help paint the classrooms and also to purchase brand-new tables and chairs. Today's lunch was donated by Rep. Cinta Kaipat's Family. Special thanks to Chefs Del and Lee Lieto. Thanks, Olomwaay, Si Yu'us Ma'ase, and Salamat Po, Everyone! Rep. Cinta Kaipat huddles with the volunteers. Okay, ready team? Let's Go! We painted and took out a gazillion staples tacked to the doors. We moved the desks and chairs to the side so we could paint the ceiling. We checked our paint supplies. Swept the walls to prepare them for painting. ...and painting! Gasp! It sure was hot in the classrooms and the smell of the paint was overwhelming at times. But, at the end of Day 1, the mission was accomplished and it was all worth it. Then it would be these guys and gal's turn to lead the painting party! Thank you, Steve and Miwa!